Earlier this week, we pointed to what we called the “new kid on the block” in battery tech – Vanadium. It appears that what held true for music, is true in this industry as well – “new kids on the block” arrive in groups. Now, all puns aside – as Molly Lempriere writes for Mining-Technology.com, “much has been made of battery minerals, in particular lithium and cobalt. But graphite, one of three naturally occurring carbons on Earth, is often overlooked.” And with Graphite, comes its derivative, Graphene. “Over the past eight years, an increasing number of potential uses for graphene have been explored, including its use in supercapacitors and as a membrane for filtration. Meanwhile, the ongoing revolution in materials science is continuing to yield improvements in the processing of Graphite, thus making the material earn its stripes as a “critical mineral” – a designation the Graphite has earned in both the United States and the United Kingdom. If these trend lines continue – and a look at the neck-breaking speed of the materials science revolution tells us there is a very good chance they will – the bottom line is that if Graphite and Graphene are not yet on your radar, they should be. Earlier this month, Simon Moores, Managing Director of Benchmark Mineral Intelligence and member of the ARPN panel of experts testified before the full U.S. Senate Energy Committee on opportunities and risks in the energy storage supply chain. We’re titling his observations as Moores’ Law — which is his for the taking, given the placement of the apostrophe. If he hasn’t used it yet, he should. 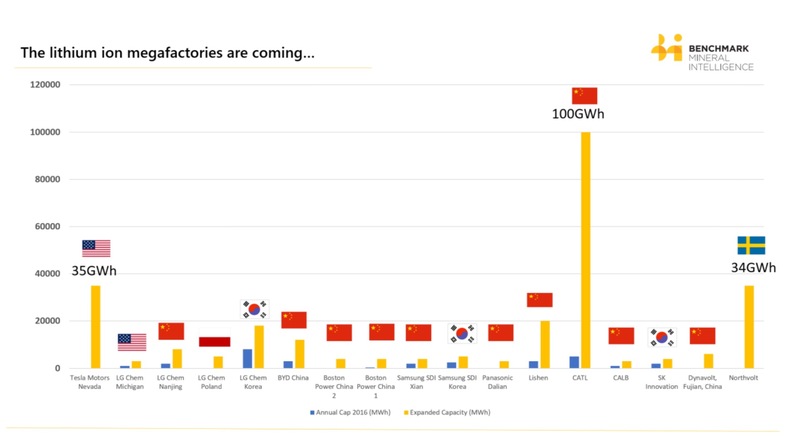 While we already featured Moores’ top line points regarding the rise of Lithium Ion megafactories (also see the chart), we would be remiss if we didn’t share some of his takeaways on the implications for the main critical raw material inputs for this technology – namely Lithium, Graphite, Cobalt, and Nickel — and add some additional thoughts. •	For Lithium carbonate and Lithium hydroxide, the “base chemicals that the battery industry seeks,” Benchmark Mineral Intelligence sees a 10-fold increase in the industry’s demand profile over a ten-year timeframe. Lithium is largely sourced from Chile, Argentina and Australia, and is processed into battery grade in the U.S. and China. •	Lithium Ion technology uses both naturally mined flake Graphite as well as synthetic Graphite, in which the former accounts for roughly 60% of inputs, and the latter for roughly 40%. According to Moores’s testimony, China dominates natural flake mining at 62% of global production in 2016, followed by Brazil at 23%. A similar scenario unfolds for refining, most of which also takes place in China. •	As we previously highlighted, the U.S. currently produces zero Graphite, with the last American Graphite mine having closed 25 years ago. •	As Moores points out, however, two Graphite companies are currently seeking to mine and process flake graphite for battery grade material in the U.S., so there is hope the supply picture will change domestically. •	You can read ARPN’s latest blog item on Cobalt here. •	Nickel production is in the million of tons a year, and from a U.S. point of view, the supply picture recently changed with our import dependence dropping from roughly 50 percent to currently 25 percent with new domestic projects having come online. Ultimately, this is food for thought for any discussion regarding the comprehensive mineral resource strategy our nation sorely needs.